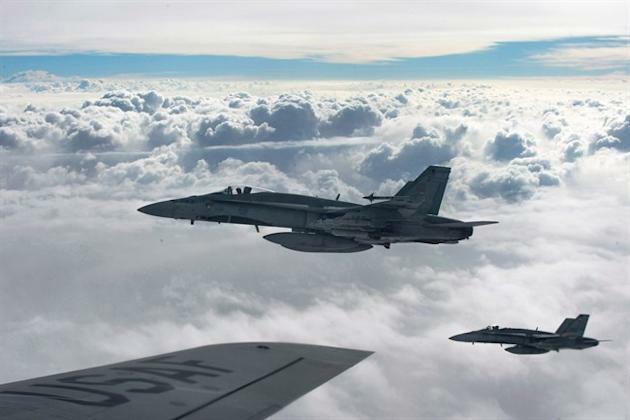 Canadian warplanes have gone into action again in Iraq, bombing a militant compound and bomb-making factory in separate raids over the last few days. Defence Minister Rob Nicholson announced the news in a conference call on Thursday, following a NATO defence ministers meeting in Brussels. Nicholson said one mission took place Wednesday and involved CF-18s hitting a compound that was used as a staging area for extremists who've been launching guerilla-style raids into Baghdad. Another attack took place Feb. 3, when the Canadian fighter-bombers supported Iraqi troops operating southwest of Mosul, the country's second largest city, which was overrun last summer by the Islamic State of Iraq and the Levant. Nicholson says that raid destroyed a factory producing improvised explosive devices. "Mosul has suffered greatly under ISIL oppression," Nicholson said. "By striking these ISIL facilities, we're disrupting their ability to produce and store weapons that are used to kill Iraqis and their security forces." There were two additional raids on Jan. 29 and 30, which the minister did not cover in his statement. Those attacks struck in roughly the same areas as the most recent missions, but were aimed Islamic State fighting positions, such as trenches and bunkers, as well as vehicles. Nicholson also condemned the brutal murder of Jordanian air force pilot Muath al-Kaseasbeh, who was burned alive by his ISIL captors in a grisly execution that was recorded and distributed on the Internet.